We arrived in Serre-Chevalier around tea-time on Monday, after two frustrating bad-weather days in Les Deux-Alpes. The weather was clear, and the forecast was good. 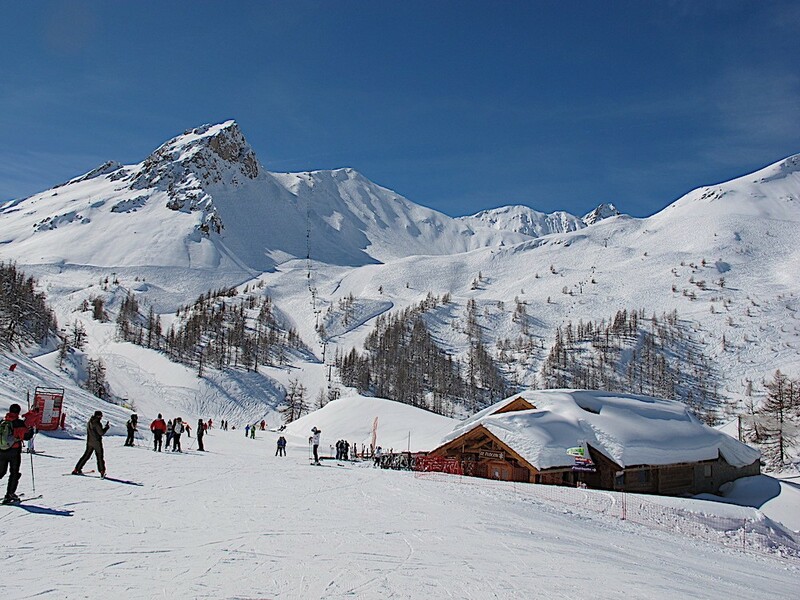 In an ideal world, we’d have skied Serre-Che in the bad weather and treeless Deux-Alpes in the sun. Hey ho. Tuesday dawned with sun and cloud, with more of the latter in the western skies, so we decided to spend the day in the eastern part of the long Serre-Che piste network, focusing on what the area has to offer blue-run skiers (a particular angle we’re taking in our new guide books). As you might hope after a storm, the conditions were pretty near ideal, and we had a great morning checking out the runs between easterly Chantermerle and central Villeneuve, and then above Briançon at the eastern extremity of the system. The broad conclusion: lots of excellent blues, with no problems getting around the area – but practically all the runs require a degree of competence and confidence: there are few motorways. We had time to remind ourselves of the excellent reds on the upper mountain above Briançon, too. Run of the day was Remparts – varied, smooth, quiet. Then we settled in to the calm, airy Chalet Pra Long near the gondola mid-station for an excellent lunch (lubricated by what is now my favourite Belgian beer, Affligem – recommended). On the way back to Chantemerle we made time for a diversion to a favourite spot – the lovely, deliciously quiet reds served by the isolated slow Aiguillette chair-lift, in the woods on the upper mountain. True to the forecast, Wednesday brought cloudless skies for our exploration of the western end of the piste network, between Villeneuve and Le Monêtier. Finding ourselves passing the thoroughly good little Peyra-Juana hut (and it really is a hut) an early lunch was indicated, and the plat du jour did not disappoint. Blue run assessments completed, we had time for some fun on the splendid reds high up on Pic de l’Yret and low down in the woods, all blessed with superb packed powder. With the vital Cucumelle chair-lift closed for repairs in the afternoon, we had to resort to the valley ski bus to get back to our Chantemerle base. This now costs an outrageous €2 a go, but tickets were being handed out by lifties as we passed the lift in the morning. 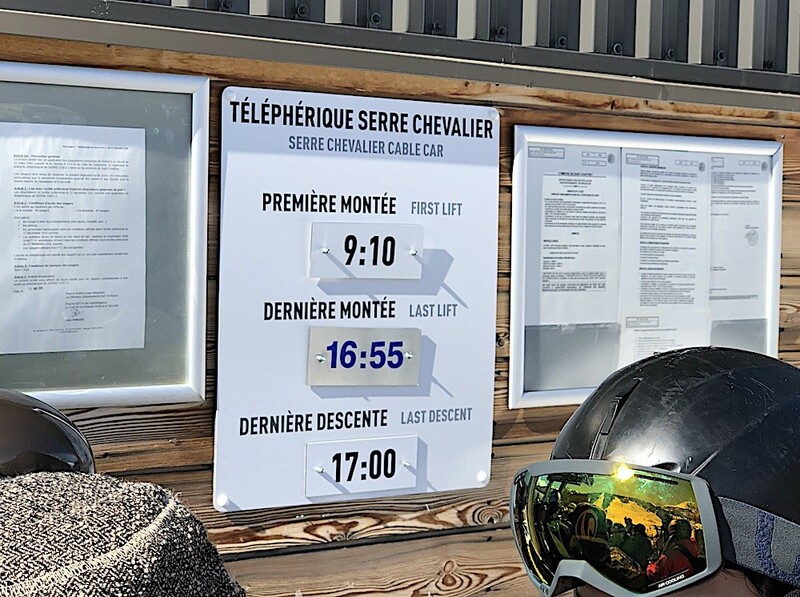 Back at Chantemerle, we had time for a final top to bottom run from the peak that gives the whole resort its name, down the red Draye and then the easy Luc Alphand black– only slightly mogulled, and a great way to end the day. We were particularly glad we managed to catch the black, because we were staying in the famous Luc’s hotel, La Balme. Expertly run by his Swedish wife, this is a small, simple but stylish and welcoming b&b place a walkable distance from the lifts (and with free ski/boot storage at M Alphand’s ski shop at the lift base). Recommended.